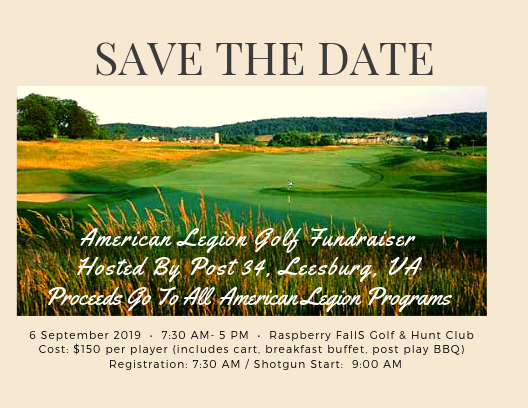 Save the date for Leesburg Post 34 Golf Tournament Fundraiser being held at the Raspberry Falls Golf and Hunt Club which will be held on September 6, 2019. The cost will be $150.00 per player which includes cart, breakfast buffet, and post play BBQ. More information and registration material will be distributed later. For more information contact Post 34 Commander James Grenier or Post 34 Adjutant John Ward.